The start of the 2018-19 men’s hockey season for Laurier was largely a tale of two halves. After beginning the season with one win in their first eight games, the Golden Hawks rebounded with a 6-2-0 record to close out 2018, restoring hope that a playoff appearance at season’s end was within reach. 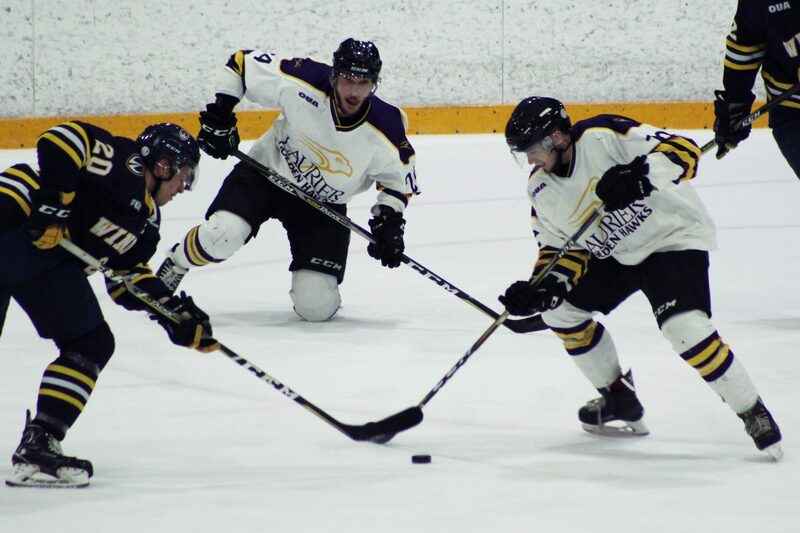 After a month long winter break, Laurier opened up the new year with a weekend series against the Windsor Lancers. Both teams entered 2019 with identical 7-9-0 records, sitting mid-table in the OUA West conference. “I think on the whole we played pretty well,” head coach Greg Puhalski said, in regards to the team’s performance in the first half of the season. In game one of the weekend series, the Hawks had no answer for Windsor goaltender Jonathan Reinhart, who made 25 saves in a 3-0 shutout win. A scoreless game through the first 39 minutes, Windsor was finally able to sneak a goal passed Hawks’ goaltender Tyler Fassl with one second left in the second period. As Laurier started to apply more pressure in the third, Windsor answered with two goals mid-way through the period to put the game out of reach. Similar to the first game of the weekend series, the second meeting on Saturday night saw neither team find the score sheet in the first half of the game. Mid-way through the second period, Laurier finally found the back of the net, with winger Ethan Wiseman tipping home the team’s first goal of 2019. The Hawks weren’t able to hold onto the lead for very long, as Windsor answered back a few minutes later with a power play tally. The rest of regulation would see both teams trade chances, but overtime was ultimately needed to decide the result. After a few more high quality chances in the extra frame, Windsor was finally able to put Laurier away and complete the weekend sweep. Cutting down the goals against is a trend that the Golden Hawks want to continue going forward, and in order to do so, the team brought in reinforcements in net over the winter break. Goaltender Olivier Lafreniere was added to the roster, as Puhalski confirmed that Jacob Standen, who was injured in the team’s first game of the season, would be shut down for the rest of the year. Lafreniere comes to Laurier with two seasons of OHL experience under his belt, hoping to help reduce the workload of Tyler Fassl going forward, who has played in 17 of the Hawks’ 18 games thus far. “For us, we’re not going to be a high scoring team. It isn’t going to be our identity,” Puhalski said. With leading scorer Brandon Robinson leaving the team in November, Laurier now finds themselves without an active player inside the Top 50 for scoring in the OUA. Furthermore, only three teams in the province have scored less goals than the Golden Hawks this season. Following the weekend series against Windsor, Laurier sees themselves slip to ninth in the OUA West. With only ten games remaining in the regular season, the Hawks need to start stringing together wins sooner rather than later if they want to keep their playoff hopes alive.